There are three paths of worship in Hinduism. First, there is devotional worship, known as Bhakti yoga (‘yoga’ means ‘discipline’, or practice). In Bhakti devotional worship, the devotee prays, sings hymns, lights incense, and performs rituals to gain favor with the gods and heavens. It is impossible not to notice that most of what we call ‘religion’ the world over is in fact forms of Bhakti practice, devotion to particular gods and ancestral spirits. The two most populous forms of Bhakti Hinduism are Shaivism, the worship of Shiva (the transformer and destroyer) and his incarnations such as Ganesh (the elephant headed god), and Vaishnavism, the worship of Vishnu (the savior or preserver) and his incarnations such as Krishna. Worship is often called ‘darshana’, or seeing/experiencing, and Hindus will say, I am going to the seeing, meaning I am going to see and be seen by the god. Another common form of Bhakti devotion is worship of a particular goddess such as Kali. Notice that, like a scientist, Bhakti practitioners also believe in learning by experience and seeing, but their subject matter is quite different. Raja yoga, the second path, is worship by meditation and asceticism (living in isolation, standing in place for days, fasting chanting the names of gods for hours, sitting on spikes, and other means of hard activity) meant to gain a meditative state of insight. 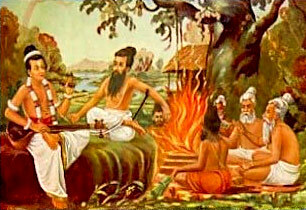 Raja means ‘force’ or ‘effort’, and India is famous for its forest sages practicing these techniques. 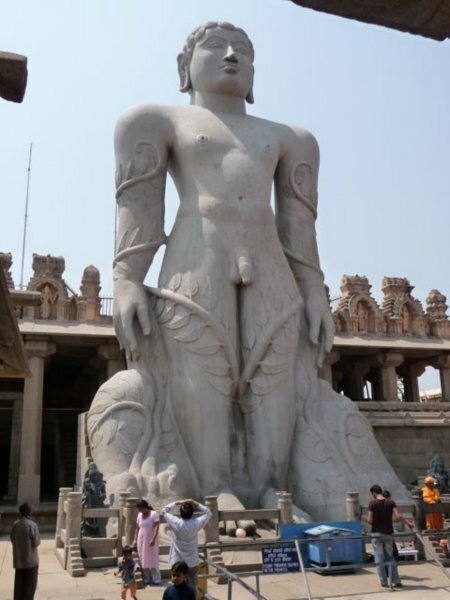 As we will study soon, the Jains and later Buddhists became famous for their practices of discipline, training both the body and the mind. 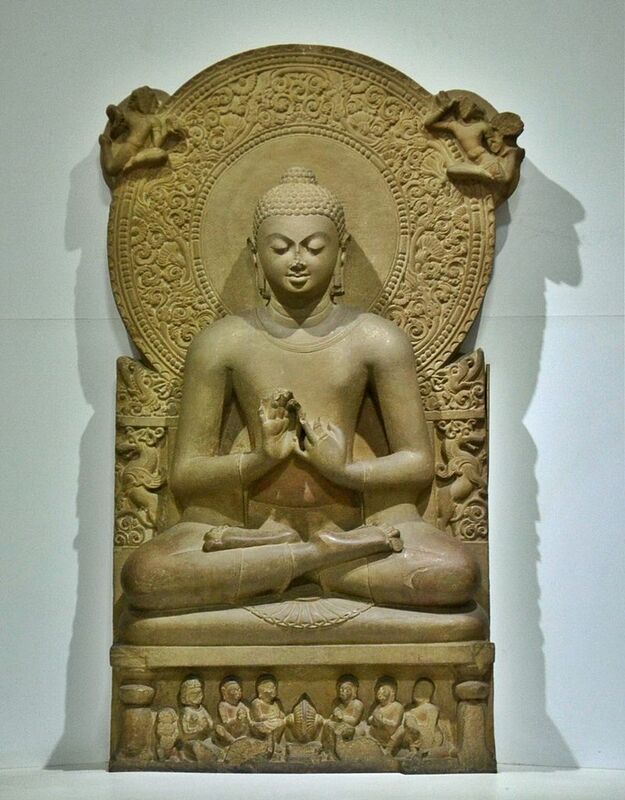 Jains would sometimes stand in the jungle for such long periods of time that vines would grow up their bodies, as depicted in some of their venerated images. 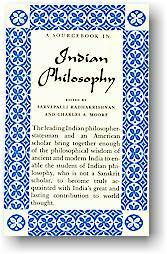 Jnana yoga (“zshna-na”), the third path and my personal favorite, is worship by acquiring knowledge, wisdom and understanding the order of things through study and philosophizing. This class itself could be seen as a form of Jnana yoga, designed to bring you closer to the core by studying the ways of the world. All three paths, or any mixture of the three, are understood to work towards the same goal: liberation from the bonds of attachment and desire, rising into enlightenment and release from the constraints of identity to join together with the whole. There are two ultimate goals to this process. First, there is hope for a better next life. Many are familiar already with the Hindu idea of reincarnation. This is not a form of afterlife particular to India, but in fact there is evidence that many tribal cultures and early Egypt believed that one’s present life will be reincarnated in another life on earth based on one’s actions and intentions. This interconnection is called karma, which simply means ‘action’ in Sanskrit. Interestingly, physical causation is karma, just as it is also metaphysical causation (next life physics), an understanding of cause and effect applied to a different sphere of existence. If you punch someone in the head, it is karma that makes their head reel backward, and karma that also weighs down your chance for a favorable life after death in the Hindu tradition such that if you punch too many people, you get reborn a cockroach. Second, there is hope for release, for freedom from rounds of rebirth on earth. This can be thought of as dwelling in a heaven with one’s personal or family god, but also as a dwelling with the order of things without residing in any particular place. Bhakti yoga tends to favor the dwelling with a lord, while raja and jnana tends to favor the dwelling with the universe as a whole, however it is important to remember that some Hindus believe that both amount to the same exact thing (while others will insist that their school’s truth is ‘more true’, the same variation one finds in any religion and in our own culture). This release is also called Moksha and Samadhi, but in America we know this first and foremost by the same name as the famous grunge band, Nirvana. While moksha is the ultimate goal, via the more immediate goal of positioning oneself favorably for moksha either in this life (dwelling in the forest or a monastery) or in a next life, there are three other goals that Indian philosophy points to as desirable making four in total. In addition to moksha/nirvana, there is law or morality, ‘dharma’ (the term Jains and Buddhists use to describe their traditions and rules), pleasure, ‘kama’ (as from the Kama Sutra), and material well-being or comfort, ‘artha’. Clearly, the overall idea is that pleasure and comfort (kama and artha) are not in themselves evil, but one should pursue liberation through discipline (moksha through dharma), first and foremost. 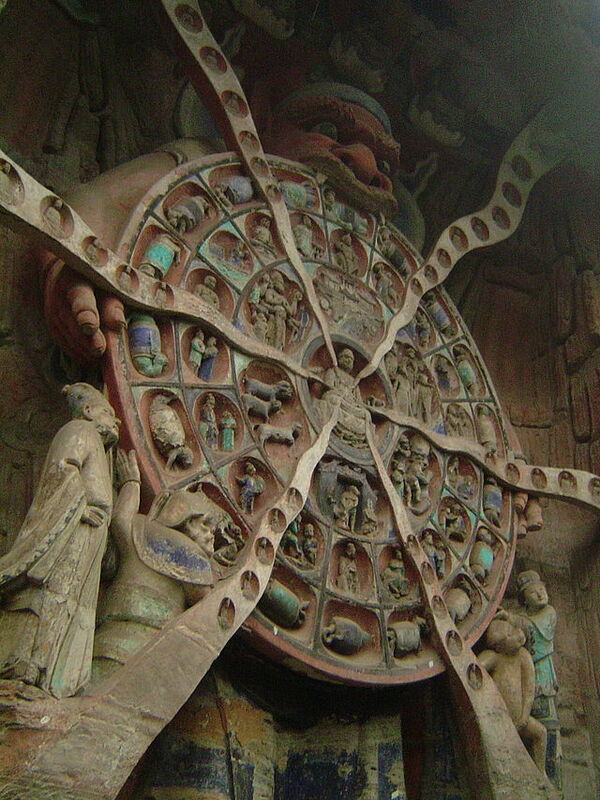 Buddhists symbolize dharma with a wheel, one of the earliest images of Buddhism found. 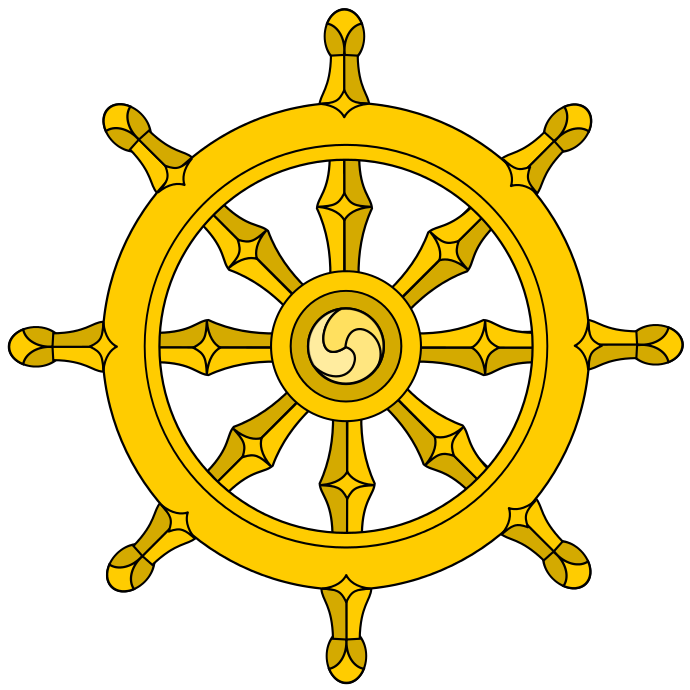 Just like early Christians identified with the symbol of the fish before depicting Jesus, Buddhists identified with the wheel before depicting the Buddha.